What is a Tricky Tray? A Tricky Tray is an event of chance. For those who attend, raffle tickets are purchased and placed in containers for the items they hope to win. One person can put as many tickets as they want in a container for a specific basket/item to increase their odds of winning. Any Information on This Year’s Tricky Tray? Absolutely! This year’s event will be held on Friday, April 12, 2019 at the Forest Hill Field Club in Bloomfield. We will have over 200 baskets and prizes (Level 1 and 2 Baskets and, Grand and Super Grand Prizes) as well as a 50/50 Raffle, Door Prizes, and up to 2 other separate Raffles. It is a fun filled night with many laughs among parents, teachers, and friends! The Tricky Tray fundraising event is Demarest Home and School Association’s (HSA’s) largest and most profitable fundraiser; therefore, we need everyone’s help to make it a big success! Where do you get the prizes? Hundreds of letters are mailed to potential donors, follow-up phone calls made & local businesses receive an in-person plea. Parents donate money towards Grade Baskets, many also donate prizes on behalf of their family or graduating sixth grader & some of our most popular prizes come from teachers. The remaining is at the expense of the HSA. Buy a Ticket: Be ready – first come, first serve. Only 250 tickets will be available. Support your Grade Basket: Each grade will be represented in our Event Program. You can donate item(s) per assigned grade theme or monetary donations are accepted in any amount. Click here for class basket donations. Donate a Basket/Prize: Have your family, business, neighborhood, or any specific organization represented in our Event Program. Basket/Prizes or monetary donation are accepted. Click here for family basket donations. Click here for business donations. Donate Wicker Baskets: No need for new, can be gently used. Click here for more information. Volunteer! 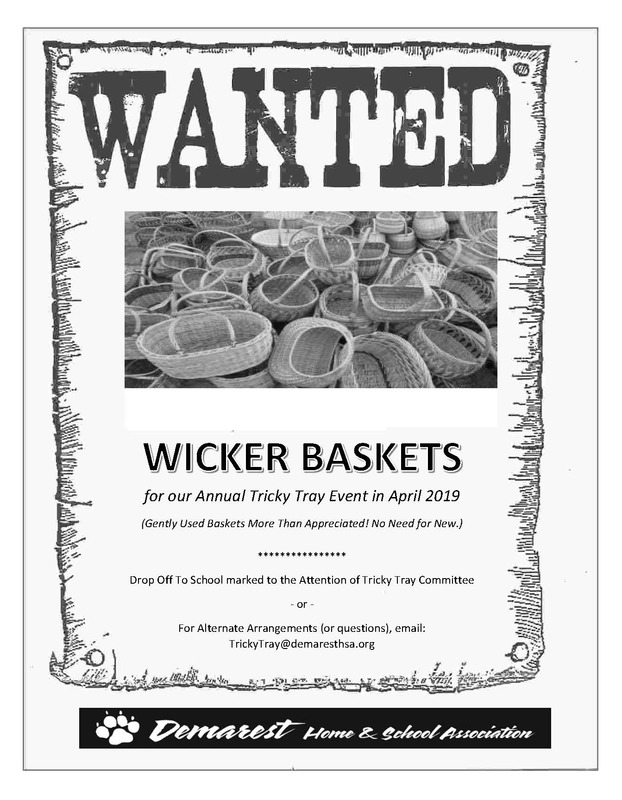 Email us at TrickyTray@demaresthsa.org and let us know you want to help and we will let you know where help is needed or let us know if you have something specific in mind.